Moveabout Therapy Services provides individual and group therapy services for children. Through empowering children and families, MoveAbout Therapy Services provides tools for living outside of the therapy environment. The team at MoveAbout use developmental frameworks and techniques to support children to achieve success in activities of daily living and functional activities. Our clinicians have experience and training in Australia and the United States of America and continually aim to provide the best service based on the most current information. 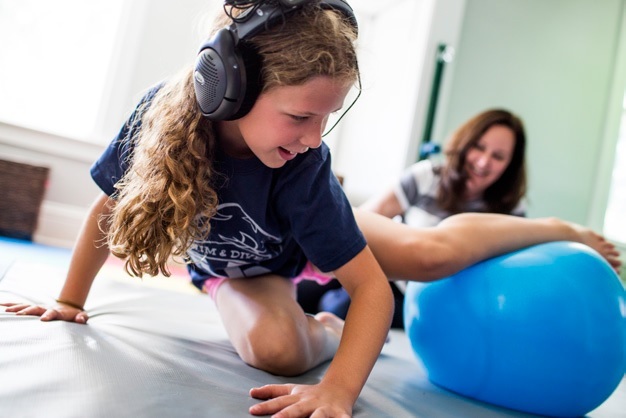 MoveAbout Therapy Services aims to assist children to reach their full potential, and to empower families to share in their child's growth and development. By taking a holistic approach to evaluation and treatment, and assessing each child's developmental levels and individual differences, underlying challenges can be better understood and the difficulties that a child is experiencing can be resolved more quickly and more fully. We aim to improve collaboration between all health professionals relevant to the child, and work in partnership with families. The staff at MoveAbout Therapy Services are passionate about what they do, and committed to ongoing learning to constantly improve our practice and stay up-to-date with new evidence and techniques. Every therapist at MoveAbout Therapy Services receives individual mentoring from a more experienced therapist in their own discipline to enhance therapeutic reasoning, and to problem solve clinical challenges. Therapists also receive mentoring from other disciplines to enhance our treatment. For example, whilst an occupational therapist can never replace a skilled speech pathologist or psychologist, gaining a better understanding of language development and emotional development will allow the occupational therapist to identify strategies to support development in these areas during occupational therapy treatment sessions. The MoveAbout Therapy Services team meet weekly to present cases they are working on via video of treatment sessions. During these meetings, the team discuss clinical challenges and work together to improve the outcomes for each child. Our team also participate in supervision with ICDL and Profectum faculty members Beth Osten (occupational therapist), Sherri Cawn (speech and language pathologist) and Diane Selinger (psychologist) as well as Fragile X expert Tracy Murnan Stackhouse. In this newly revised workshop, you will learn to use Therapeutic Listening modulated audio selections (available on CDs, digital music players and some mobile devices) to create individualized, home-based programs for clients. This course will provide a strong emphasis on practical application and explore the use of Therapeutic Listening within the context of multiple case studies. You will also learn how to implement Therapeutic Listening strategies in conjunction with postural, respiratory, and sensory activities. This course will take you through all of the steps, from assessment to outcomes, for creating complete Therapeutic Listening programs. Video case presentations will be used to illustrate points and show changes in individuals with listening and other sensory processing difficulties, including Autism, Cerebral Palsy, apraxia, anxiety, and Down's Syndrome. This workshop will be especially meaningful for professionals who have a background in sensory integration, including practitioners in schools, hospitals, and private clinics. Participants will gain the necessary background information to begin using Therapeutic Listening right away. The specialized headphones and digital music players or music albums required for Therapeutic Listening are available for purchase upon course completion. -Describe the relationship between listening and sensory integration. -Identify individuals with sensory processing and listening difficulties who may respond well to Therapeutic Listening. specific needs of individual clients. -Demonstrate understanding of the role of postural, respiratory, and sensory strategies that are part of the Therapeutic Listening program. Sheila M. Frick, is an internationally esteemed clinician, lecturer and pioneer in Occupational Therapy. Her expertise includes sensory processing dysfunction, sensory integration and auditory interventions. She created and continues to expand Therapeutic Listening, which she has taught to over 10,000 therapists worldwide. She also lectures on such topics as clinical neurology, respiration, the vestibular/auditory system, and various auditory interventions. She is the creator and author of Listening with the Whole Body, and co-author of Core Concepts in Action, Astronaut Training, and Out of the Mouths of Babes.